Bell & Ross and Shaw Harley-Davidson introduce their second collaborative concept motorcycle and timepiece, the BR01 B-Rocket. Bruno Belamich, Bell & Ross Co-Founder and Steve Willis, Shaw Harley-Davidson Dealer Principal, discuss their partnership and creations. Introduced at BaselWorld 2014, Bell & Ross’ B-Rocket is the corresponding timepiece to the collaborative concept motorcycle between Bell & Ross and Shaw Harley-Davidson. As their sophomore collaboration, the first introduced in 2011, the project was inspired by 1960s and the American jet aircraft. One of two versions. 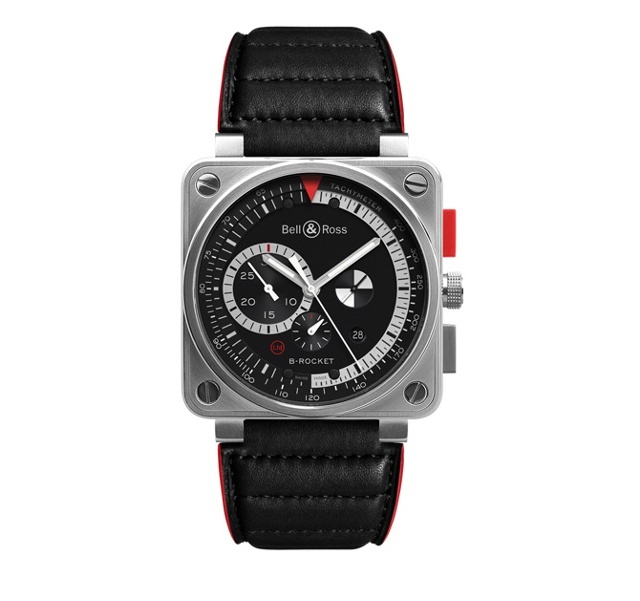 The BR01 B-Rocket features a mechanical, automatic movement. Its functions include hours, minutes and small seconds as well as datum tachymeter scale and chronograph; including 60-seconds, 30-minute and 12-hour. Its case is forged from satin-polished steel and measures 46mm in diameter. The dial is matte black and skeletonized with metallic, luminous hour and minute hands. Adding comfort to the driver’s wrist, a padded black leather strap edged in red and black on heavy-duty canvas. The motorcycle is aerodynamically optimized with a low driving position and is reminiscent of a rocket. The rear section is inspired by an aircraft canon and was created using over 30 different sections of steel. Side mounted turbines evoke a jet-engine aesthetic with their functionality rapidly discharging air to achieve higher speeds.